"AL 4" redirects here. For Alabama State Route 4, see U.S. Route 78 in Alabama. Alabama's 4th congressional district is a U.S. congressional district in Alabama, which elects a representative to the United States House of Representatives. It encompasses the counties of Franklin, Colbert, Marion, Lamar, Fayette, Walker, Winston, Cullman, Lawrence, Marshall, Etowah, and DeKalb. It also includes parts of Jackson, Tuscaloosa, and Cherokee counties, as well as parts of the Decatur Metropolitan Area and the Huntsville-Decatur Combined Statistical Area. 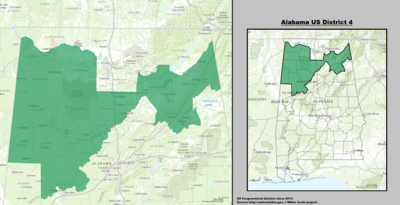 Alabama's 4th congressional district - since January 3, 2013. It is currently represented by Republican Robert Aderholt. In the 2016 United States Presidential Election, the district was the only one in the country to give Donald Trump more than 80% of the vote, making it the President's strongest district in the country. Alabama’s Fourth Congressional District also had 166 opioid prescriptions per 100 people, the highest rate of any district in the nation according to a study published by Harvard’s T.H. Chan School of Public Health. March 3, 1837 Redistricted from the 3rd district. March 3, 1851 Elected in 1846. January 21, 1861 Elected in 1856. March 3, 1869 Elected for partial term in 1868. March 3, 1877 Elected in 1868. July 20, 1882 Elected in 1876. Seat declared vacant after 1880 election was contested by James Q. Smith..
January 9, 1885 Elected to fill his own vacancy. March 3, 1885 Won 1882 contested election. June 4, 1890 Lost 1888 contested election. March 3, 1891 Won 1888 contested election. March 13, 1896 Elected in 1892. February 9, 1898 Lost 1896 contested election. March 3, 1899 Won 1896 contested election. March 8, 1900 Lost 1898 contested election. March 3, 1901 Won 1898 contested election. March 3, 1907 Elected in 1900. February 8, 1921 Elected in 1910. Re-elected in 1920, but died before that term began. January 3, 1935 Elected to finish Blackmon's term. January 3, 1951 Elected in 1934. January 3, 1963 Elected in 1950. January 3, 1973 Elected in 1966. January 3, 1997 Redistricted from the 7th district. As of May 2015[update], there are no former members of the U.S. House of Representatives from Alabama's 4th congressional district that are currently living. The most recent representative to die was Tom Bevill (served 1973-1997) on March 28, 2005.